You get what you pay for? Actually, in this case you get more than you pay for. Usually I review the more high end components. But every now and then a cheap component crosses my paths and I decide to give it a go. After all, expensive isn’t always better, that I’ve learned a long time ago. So here is a dirt-cheap little (in fact it’s tiny) dac with even smaller adapter-style power supply. What do you get for 300 euro? More than you could reasonably count on as it turns out. Looks can be deceiving. Everybody knows this. Me too. And I know that unassuming devices can turn out to be much better than you’d give them credit for. Still, I was in no hurry to hook it up. I just knew that it wouldn’t be much. Mind you, I have pretty serious digital components and have listened to almost anything available, including Weiss, Wadia, Levinson, Krell and dCS. I decided to use the PC as a source and not the cd player because a: my cd player is not going to be upgraded by this or any dac and b: most people aren’t interested in cd players anymore. Network audio is the rage. But when I did hook it up (after being connected to the mains for several days), I was pleasantly surprised. The dac doesn’t sound thin. It doesn’t shout. It actually sounds smooth and slightly warm. Its treble is very fluid and silky, that wasn’t expected. What was expected was a less than gut-wrenching bass. Nope, it doesn’t have killer bass, but nor do many other dacs, even pricy ones. What is perhaps its best property is its spaciousness. 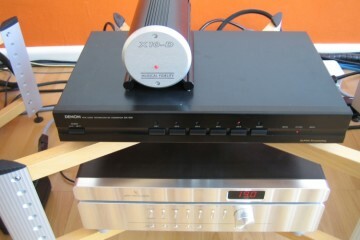 The soundstage is very wide, in fact my Mark Levinson no.360s doesn’t even beat it in this respect. And the 360 is a very spacious-sounding dac. The Vdac’s soundstaging however isn’t very deep. It has fine focus but it is not in the Levinson’s league. The latter is more finely resolved and both more airy and more focussed. 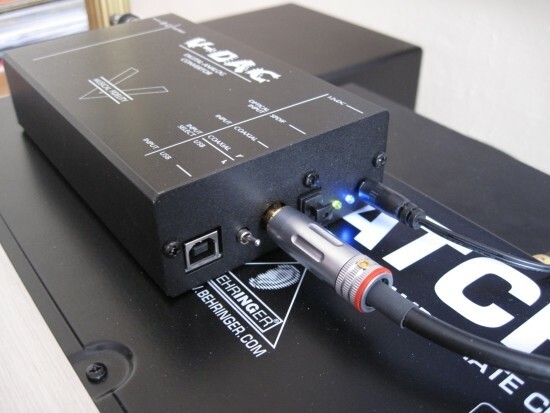 Never mind that I can find differences between the V-DAC and my high end dacs, the V-DAC sounds utterly natural, absolutely not synthetic and it manages to avoid sterility and harshness. This really is more than you could ask at the price. 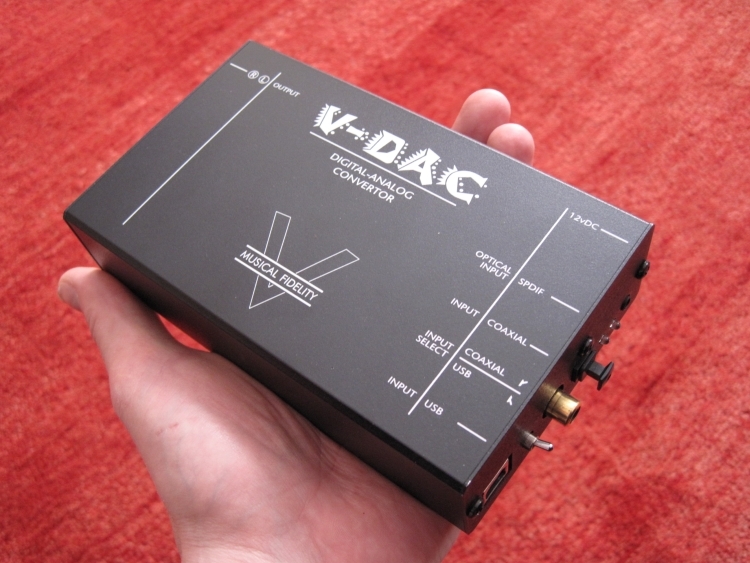 The V-DAC also handles 24bit/96khz files very well, both via coax and USB. 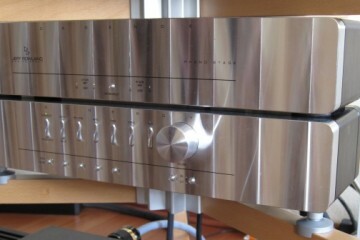 I’ve also compared it to the Behringer’s built in dac since it was here anyway. The results can be summarised as following: it was no contest. The Begringer is very forward, thin and edgy. It is no fun to listen to. The V-dac is much, much more refined. Compared to Denon’s DA500 dac, the V-Dac is lighter on its feet, with much better detailing and focus while also being more airy. The Denon easily beats it in the bass department though. I guess in this price category you just can’t have it all. Yes, this dac also has a USB input. I must admit that I have reservations about this connection method as well as firewire, as regular readers may know. 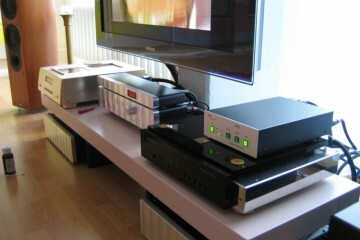 See this article for more info or read the Weiss Dac2 review. In this case though, only half of my fears came true! In all other cases when I used firewire/usb, the sound was too controlled, perhaps simply too correct, that music played from PC sounds too digital compared to playback on a cd player. The V-DAC’s USB input does sound different from the coax input but not neccesarily in a bad way. When switching from coax (from a very good EMU soundcard with proprietary drivers) to USB you notice a more relaxed sound with more air. There’s something distinctly analog about it. it sounds more free and maybe even more spacious than coax. But there’s a tradeoff. There’s always a tradeoff, isn’t there? In this case, it’s the bass. With coax it is nicely formed, not extremely powerful but good and visceral. With USB it is thinner and less powerful. It is also slightly dry, like I hear more often with direct connection methods such a USB and firewire but in this case luckily the treble doesn’t suffer from it. The highs stay fluid and airy. So I guess that it comes down to taste in this case. When connecting a usb cable (and I used a very standard 5 meter long cable) the computer (win XP) automatically starts looking for drivers and, lo and behold, finds them. From that moment on the dac just works. But hey, there are secretly still settings to be made. In whatever playback application you use there should be a place in the settings where you can assign the WAV stream to a couple of outputs. Some applications can’t do this, such as iTunes for PC but that program sounds very bad anyway so you should avoid it. Again, for PC use. On Mac iTunes is excellent. Must be a driver-roundabout thing. Anyway, the outputs available are usually Microsoft Sound Mapper, the Musical Fidelity USB dac and that of any soundcard you have installed. Now, normally going direct is the best thing to do so you select the USB dac directly, thereby bypassing windows’ built in kmixer and such. When I use my PC with the EMU soundcard, the direct route is indeed the best method. But in the V-DAC’s case I particularly liked the extrafluid and “analog’-like presentation when the sound was routed through Windows Sound Mapper. For various reasons, doing so rounds off the sound but since the V-DAC is tight enough already, this proved to make for very musical results. 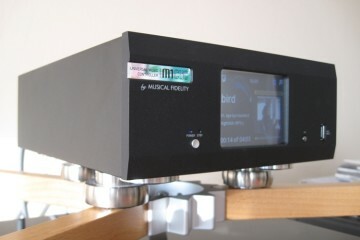 Switching the settings to the USB dac directly made for a more rhythmic and dynamic presentation, but with thinner bass. I suppose the latter is the most precise solution. It is most correct. But is most correct also most enjoyable? Only you, dear reader, can answer that! 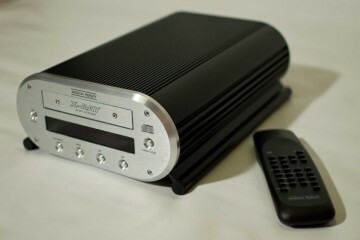 If you’re looking for a cheap dac to use with your computer or dvd player, go out and just buy this thing. It really is much, much better than you’d expect.